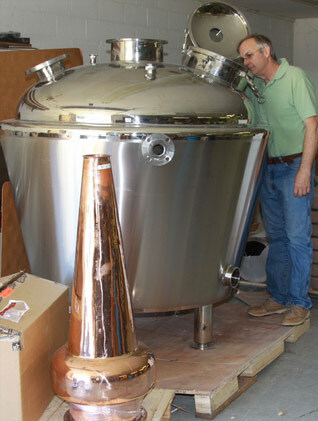 Our new 320 gallon pot still has arrived! When it’s up and running, this behemoth will give us the capability to distill up to 30 gallons of whiskey in a single run. It’s the exact twin of our 60-gallon still, but without the fractioning column. It will be used as a first-pass stripper still, and finishing will continue be done on the small still located in our tasting room. Major modifications are being made on the building across the street, to accommodate this device’s 15 foot high condenser. Future plans include a bottling line and labeling machine. Next year when the new tasting room is completed, it will include viewing windows across the length of the back wall. 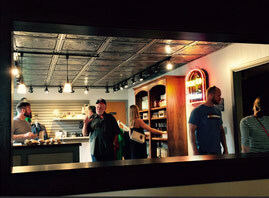 Our gift, schwag and spirits shop is now open, and new merchandise is arriving every week. This expansion doubles the space available to accommodate visitors. Come on by and take a look. We’re open every day from noon until 6:00pm.